Mayor Muriel Bowser held an Oct. 9 ribbon-cutting for The Horizon, the second of seven “short-term family housing” facilities to replace the dilapidated D.C. General family shelter, a converted hospital. The Horizon is located in Ward 7 and includes 35 apartment-style units with shared bathrooms on each floor. The larger 2-bedroom units also include private restrooms. 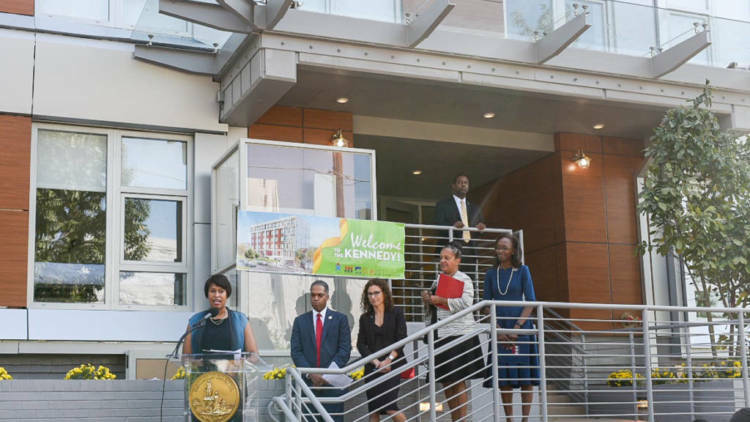 The ceremony came two weeks after a similar event to highlight the completion of The Kennedy, a 45-unit facility in Ward 4. “With these new short-term family housing programs, we are providing a chance for our families to rebuild their circumstance as they continue to contribute to our greater D.C. community,” Bowser said in a press release. Families will be moved to both facilities in the coming weeks and the third replacement facility is expected to be completed in Ward 8 next month. The other three are planned to open this time next year. Meanwhile, demolition of a building next to the inhabited portion of D.C. General continues, despite criticism from advocates and councilmembers. Bowser reiterated her promise that the shelter will close this year. On the day of the Ward 7 ribbon cutting, 34 families remained at D.C. General, according to the press release. This story has been updated to include the detail that 2-bedroom units within both facilities feature private bathrooms; also to reflect that, as of an Oct. 18 court ruling, construction of a shelter in Ward 3 will proceed despite some residents’ opposition. The article initially stated there were six short-term family housing facilitates planned, due to uncertainty surrounding the Ward 3 location. There are once again seven locations in the works.